The thick skin of the ridgegourd along with its ridges are normally thrown away as trash by most of the people. Konkanis make use of it to prepare a mouth-watering, tasty and spicy Thambali/Chutney.This goes well with the meals, pej(rice kanji) and even with dosa/idli. Soak tamarind in very little water. Fry all the items, except the ridge gourd skin and salt. Remove from the flame and transfer it to a small vessel. In the same pan, fry the ridge gourd skin, using little oil for 5 mts on a low flame. After it gets cooled, grind all the items together. Add salt and mix. If required, add little water to bring it to the chutney consistency. This chutney can be used for a few days, if stored in a fridge. This is a special chutney made by konkanis on festival days. It is served as a side dish during meals. guller(a kind of vegetable available in Kerala)-6 nos. Soak tamarind in little water for a few minutes and take out the pulp. Mix jaggery, salt and tamarind pulp thoroughly. Clean the guller, cut into pieces and cook it in the above mix for 10mts. Mix rice flour in little water and add it to the above boiling masala and cook for another minute. Do phannu(season) with jeera, methi seeds, pepper, mustard seeds and curry leaves. The Dhundu is now ready. It will have a chutney texture. NOTE: Ripe plantain can be used in place of guller. Add curd to the ground mix and thoroughly mix all together. The chutney is ready. If necessary, according to the taste, salt can be added. This chutney is prepared with the raw yam and is very simple to prepare and liked by all Konkanies. It is a delicacy amongst them. It is spicy and used in place of pickle with the meal. This dish does not require elaborate pre-planning as it can be prepared with the vegetable and the condiments that are available easily. Wash, peel and cut the yam into very small pieces. Soak tamarind in very little water for a few minutes. Crush all the above items along with hing and salt to a course texture using a baby grinding stone or a grinding mixer. 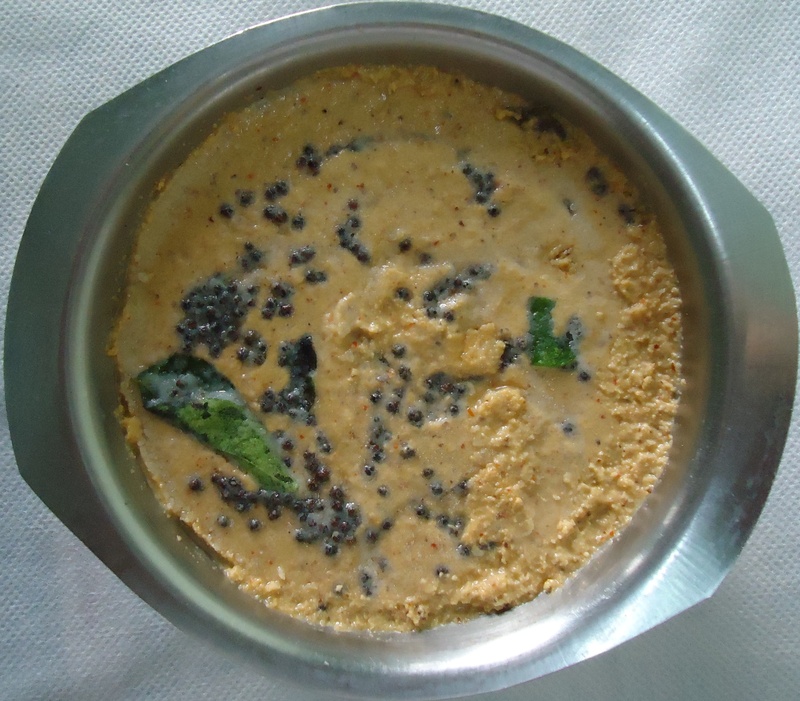 Do phannu(season) with oil,curry leaves and mustard seeds. This can be used for a week if kept inside the fridge. PIKKOLLO AMBO CHIRDILLO(SWEET MANGO CHUTNEY). This preparation is made from the locally available fully matured and ripe mango. During mango season, it is a part of the meal in the Konkani kitchen and can be prepared fast without any advance planning. Remove the peel of the mangoes and separate the pulp. Mix all the items together. The chutney is ready.